Is It Sun Poisoning Or Severe Sunburn? Neither Are Good When Camping! Sun poisoning is an allergic reaction to a sunburn. A sunburn is an actual burn caused by thermal radiation from the rays of the sun. Most of the time sunburn symptoms consist of some skin discomfort, warmth, redness, blisters, and peeling. Of course a good camping safety practice is to make sure you protect yourself from the sun to begin with. It is important to know how to apply sunscreen correctly and to wear sunscreen at all times, as well as to wear proper clothing to prevent sun exposure. Sun poisoning and a severe sunburn both have the same symptoms. 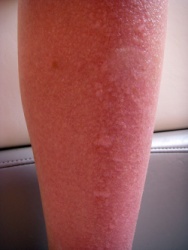 In addition to the skin damage, redness, and suburn blisters, your symptoms may include extreme itching and welts, nausea, vomiting, fever, headache, and dizziness. Due to the vomiting, dehydration is also a possible symptom. If you are camping, take a cool shower and make sure you don't get any more sun exposure. If you have returned home, a cool shower or soak in Aveeno oatmeal will help to cool down the skin. Apply a soothing lotion, gel, or topical spray, such as aloe or Solarcaine. Take an anti-inflammatory medication such as Aleve or Motrin. In addition, if you experience high fever, prolonged intense pain, or vomiting and dehydration, you should see a doctor. Take sunburn prevention seriously. Make sure you apply your sunscreen correctly to avoid a sunburn completely. how to choose the best sunscreen.